Joanne Greenbaum, Untitled, 2011, oil, acrylic, and ink on canvas, 50 x 40". These days, when should abstraction still be dismissed as retread? It is often possible that in the act of making, ideas are transcended and subsequently reinvented. Joanne Greenbaum’s exhibition has an exuberant velocity: staggered steps, carousing curves, and vibrant colors all conspiring to reassemble as they move along. Small ceramic sculptures on a low shelf twist and turn like upended ice cream cones or like Tatlin’s leaning tower. As the architect Eladio Dieste once wrote, “The resistant virtues of . . . structures . . . depend on form.” A very simple logic, but with the inhibitions of structural engineering seemingly removed, a quasi-surreal psychological space materializes; here the incongruent becomes elegant without losing its awkwardness. Greenbaum willfully walks a tightrope, risking a fall into solipsistic drama, a descent avoided but not out of sight. Any would-be balance encounters resistance during a turbulent transformation of constructivist urges into process, and, as such, knotted linearity and colored shape come up against the limits circumscribed by personal experience: In whichever direction this artist turns, with whatever strategies she uses, the result is a Greenbaum painting. Frank Stella, Alberto Giacometti, Lucio Fontana, and Tal R all come to mind, their work demanding similar conversations between materially complex paint surfaces and freestanding sculptural forms. 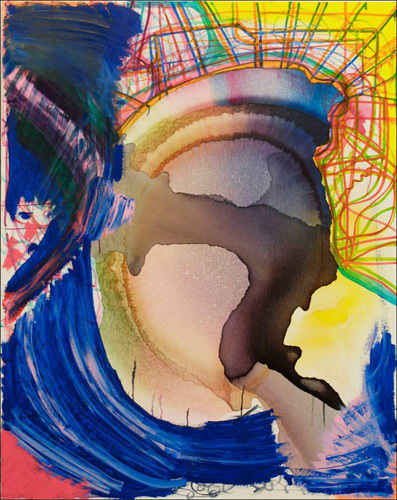 Untitled, 2009–10, is a large painting in which Greenbaum’s fluid oil, acrylic, and ink lines both contest surface area and happily convene, conjuring the spontaneity of watercolor drawing. Modeling also finds its way onto the resistant canvas surface through knifed accretions, while conversely, rivulets of glaze are guided by the push of ceramic shape over which they run. With familiar spatial illusion and passing reference to other paintings comes something better than “novel”: altogether new. Tradition can be recoined while an artist is insistently working within it.